It’s the middle of winter and probably the last thing on your mind is the incredible flavor of fresh summer tomatoes dripping with tomatoey goodness. 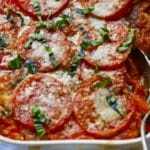 But this easy tomato casserole takes pale, flavorless tomatoes found in the grocery store this time of year and turns them into the stuff tomato dreams are made of. 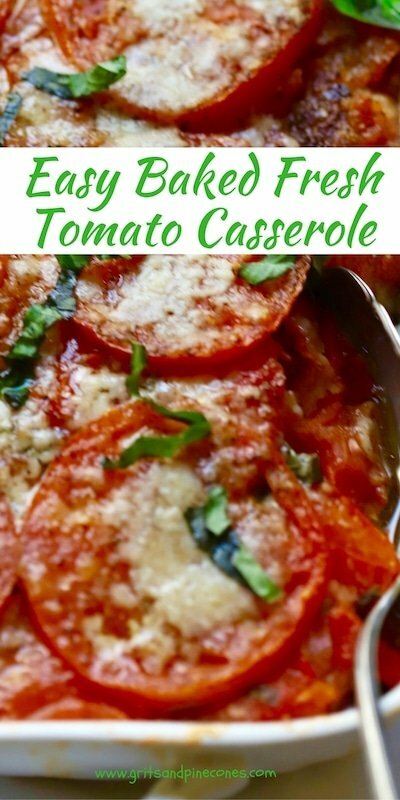 If you are looking for an easy, healthy, vegetable side dish this tomato casserole recipe is for you! Tomatoes are the major dietary source of the antioxidant lycopene, and they are also a great source of vitamin K, potassium, folate, and vitamin C. And, tomatoes are one of the few vegetables/fruits that are actually better for you when they are cooked than raw. If you like this side dish recipe, you might also like these delicious recipes: Southern Sweet Onion Casserole, Southern Green Beans and New Potatoes, and Spinach and Orzo Stuffed Tomatoes. 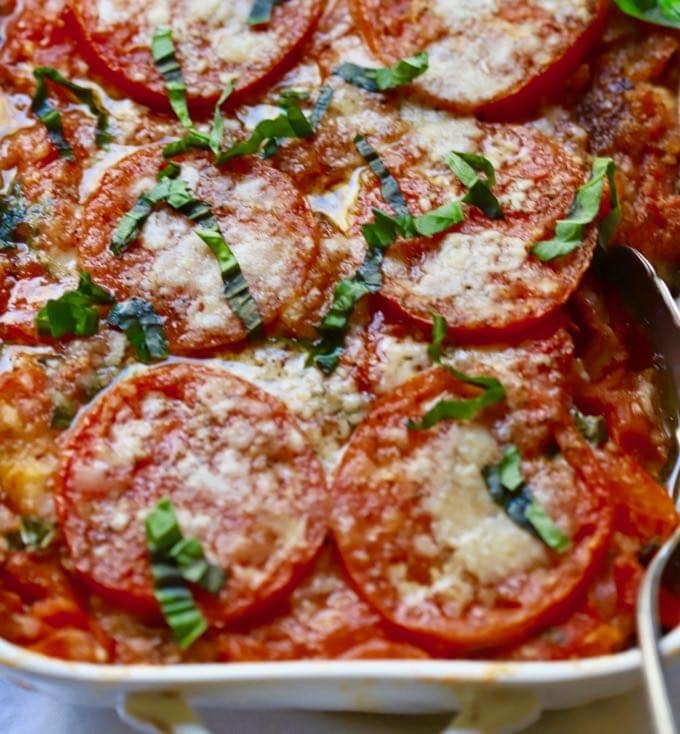 How to make Easy Baked Fresh Tomato Casserole! 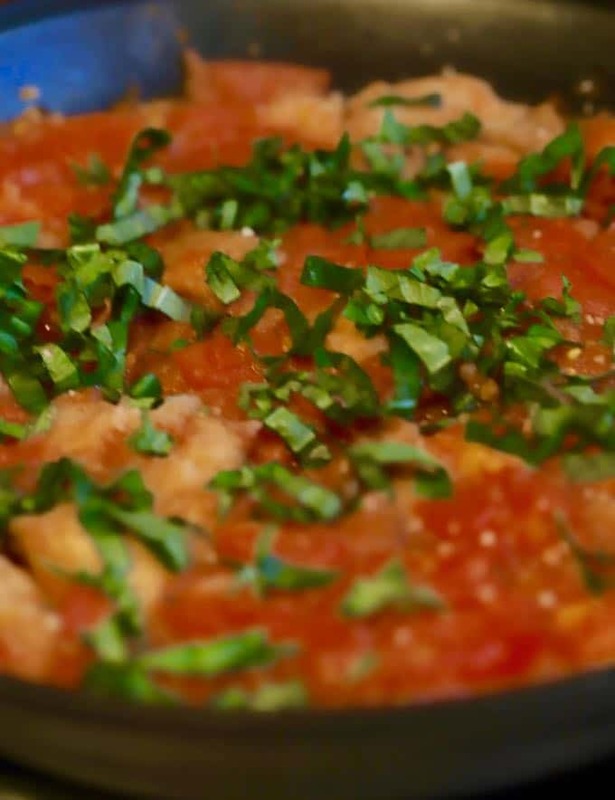 Combine the tomatoes, salt, pepper, sugar, and garlic in a large bowl and stir to combine. Set aside. Add 3 Tbsp olive oil to a large skillet over medium heat. When the oil is hot add the bread cubes and toss to coat with oil. 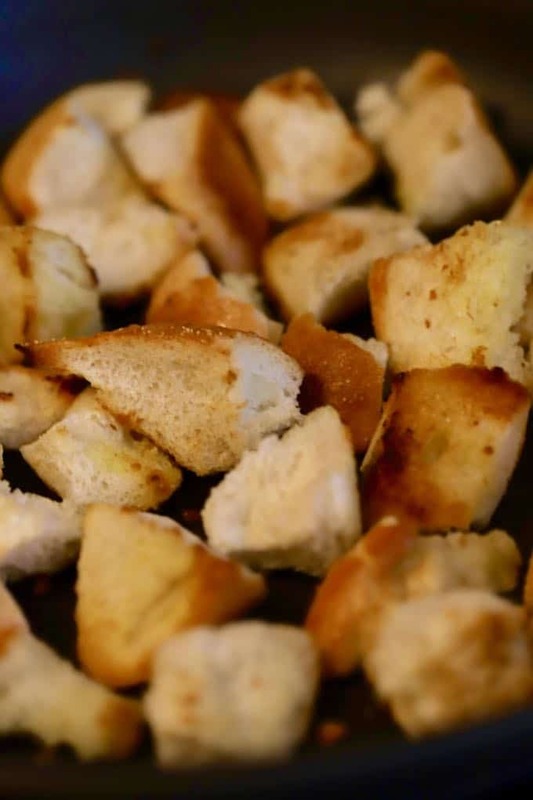 Toast the bread cubes, stirring frequently for about 5 minutes, or until the bread is golden brown. Add the tomato mixture to the bread cubes and stir to combine. Cook the tomato mixture for about 5 minutes, or until the tomatoes are bubbly. Remove the pan from the heat and add the basil. Stir to combine. 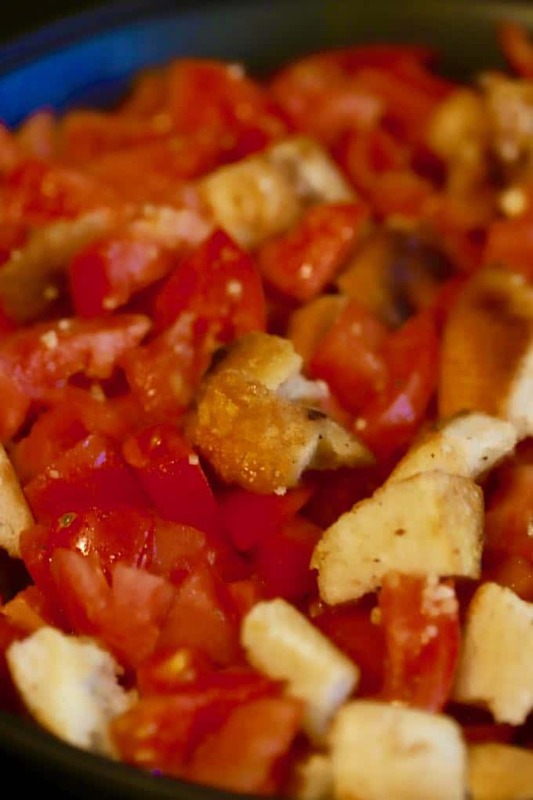 Spread the tomato mixture evenly in a medium-size baking dish, which has been sprayed with non-stick cooking spray. Top with the Parmesan cheese and drizzle about 2 Tbsp of olive oil evenly over the casserole. Bake for 35-40 minutes, or until the cheese is browned and the tomatoes are bubbly. Serve immediately. Notes: I added a layer of thinly sliced tomatoes over the top of this casserole so it would look better in photographs. This is an optional step and you can certainly add them or leave them off. 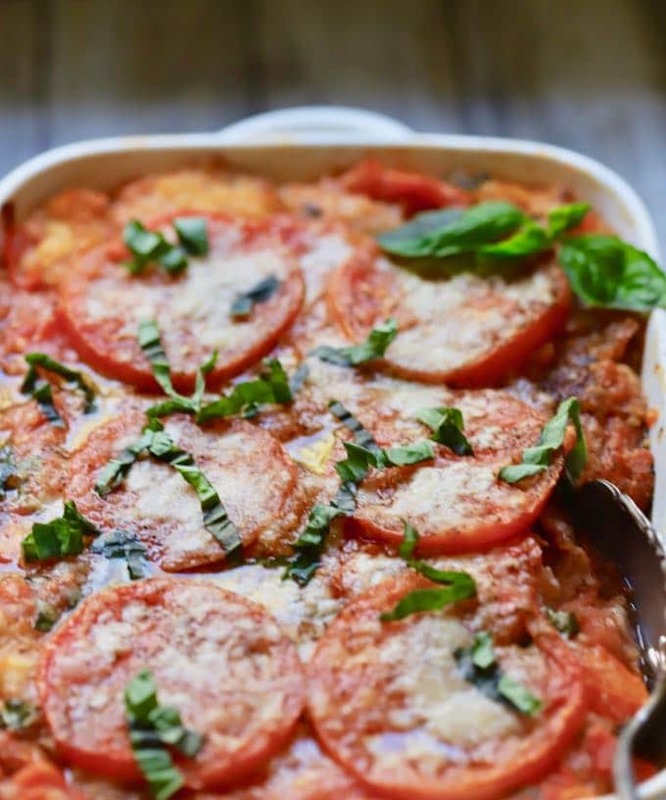 Easy Baked Fresh Tomato Casserole is a delicious and healthy, family-friendly, vegetable side-dish, which is full of fresh, flavorful, juicy tomatoes. Combine the tomatoes, salt, pepper, sugar and garlic in a large bowl and stir to combine. Set aside. Add the tomato mixture to the bread cubes and stir to combine. Cook the tomato mixture for about 5 minutes, or until the tomatoes are bubbly. Remove the pan from the heat and add the basil. Stir to combine. *I added a layer of thinly sliced tomatoes over the top of this casserole so it would look better in photographs. This is an optional step and you can certainly add them or leave them off. Do you toast the bread in the skillet or the oven ? I was confused about that part. For some reason, I never saw your question about toasting the bread. You toast it on top of the stove in the skillet. I’m so sorry I didn’t respond sooner and know this is way too late, but hope it will help someone else. I hope you enjoyed the casserole!